Now available in print or as an e-book at Amazon. "Entertaining, enjoyable reading! Have you ever wondered how it feels to be in a place no one else has ever been to? John and Susy Pint did it!" Murubbeh Cave: a deep freeze in the desert. 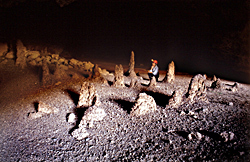 The curious "guanomites" of Ghostly Cave. 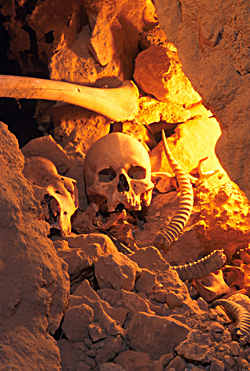 Desert caves are perfect for preserving the bones of ancient visitors. Photo by Lars Bjurstrom. Underground in Arabia can be purchased via Sandi Bookstore in Guadalajara. Born and raised in Dhahran, I thought I had seen most of the natural wonders of the Eastern kingdom from the towering dunes of the Rub’ Al Khali to the pristine reefs of the Gulf, so it was a true surprise to read the manuscript for John Pint’s Underground in Arabia. 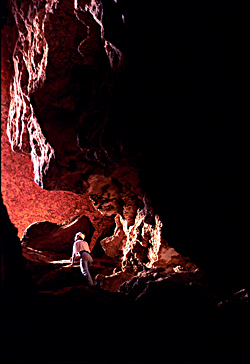 I had visited the Jabal Al Qara caves in Hofuf and knew of a few shallow holes in the jabals around Dhahran but I never suspected the scope and beauty of the caverns that existed beneath the desert, nor did anyone else. In 1983, John Pint, an American teaching English at the King Fahd University of Petroleum and Minerals (KFUPM), was wandering around the flat, featureless desert north of Riyadh when he discovered a hole the size of a serving platter. Air was blowing out of the hole, the sign of a cave below. With the aid of a chisel, he and his friend Dave Peters enlarged it enough to squeeze into. 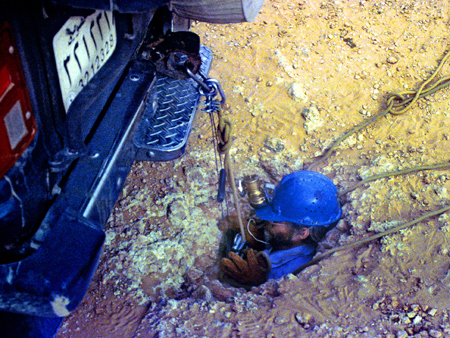 Lowering themselves on a rope tied to the bumper of a truck they descended into an underground labyrinth that had never been seen before by any human. Even the Bedouin didn’t know of its existence. Thus began John’s twenty-five year quest to discover the deepest, darkest passages underground in Arabia. 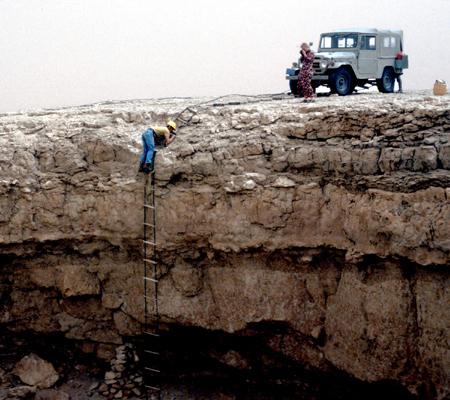 John first arrived in Dhahran in 1981 and soon met up with one of the earliest Arabian cavers, the long-time Aramcon Will Kochinski. Will and a few others had been exploring the desert caves of the Eastern Province for several years but, as he admits, they didn’t know about accepted practices, so they improvised. Using a ladder made of polypropylene rope and plywood rungs. you'd at least get stuck by the nails." 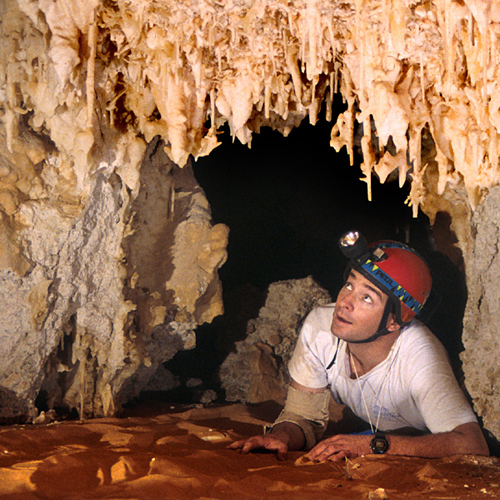 John and Will visited many desert caves in the area but they were all very bland with not a stalactite or stalagmite to be found. This all changed the day John descended into Dahl Sultan and the wondrous caves and lava tubes he went on to discover will amaze and delight the most claustrophobic reader: Massive stalagmites, delicate crystalline natural sculptures, glittering silica fountains, and vast cathedral-like caverns that rival the likes of the most famous caves in the world. And of course, the things he found within these passages are absolutely fascinating. The mummified remains of a 2000 year old fox, human skulls, and ancient boomerang-like throwing sticks are just a few of the tantalizing artifacts that will inflame your imagination and make you wonder about the undiscovered treasures waiting to be found. Somewhere in the thousands of still unexplored passages are there fabulous cave paintings, mummified hominids from 10,000 years ago or the graffiti of some long-forgotten people? Lying on a bed of red sand deep inside Whistling Teapot cave, Mike Gibson admires a lavish display of gravity-defying helictites. This cave has the "tightest entrance in Arabia." See the video on the sidebar. This book is about more than caves, it is also about the camaraderie of John’s fellow cavers and the extravagant generosity of the many Bedouin that he encounters on his quest to discover the secrets hidden beneath the sands of Arabia. It is a wonderful read, as delightful as it is informative. I’m pleased to announce that Selwa Press has just published Underground in Arabia and it is now available in print as well as an e-book in Kindle or Nook format. 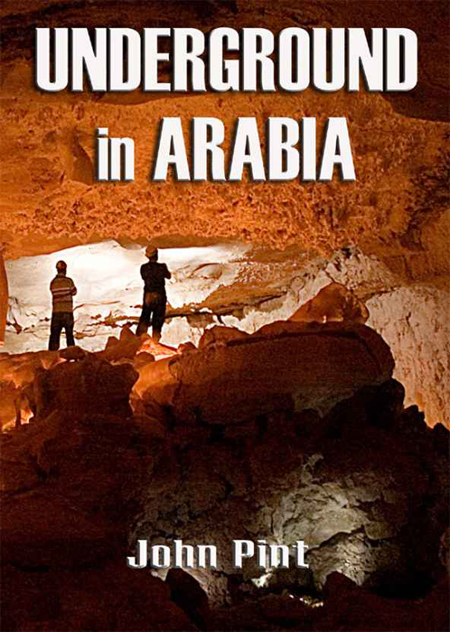 You can purchase it from Amazon (http://www.amazon.com/Underground-Arabia-John-Pint/dp/097011575X) and coming soon to Barnes and Noble. To find more information visit our website at www.SelwaDigital.com.